Just wanted to double check with you guys that this is the correct kit and with this and the internal gears that I haven't forgotten anything! Obviously I haven't included ring & pinion gears. Mine I think are a bit worn but not horrendous so think I'll keep them unless I come across a good 2.83 before the rebuild. Hats off to you for thinking rebuild instead of replace! I did a bit of searching for parts when my 7.25" bought it last year- and finally decided to just look for an 8" to swap in. Mine was in far worse shape than the one in your video however (yours is probably salvageable :^). Took less than a week to find a guy swapping up to a 9" on Craigslist. Including the cost to have the back end of the driveshaft refit with a larger U-Joint, it was about $200 and took me about an afternoon to swap out (of course, I also put in some new leaf springs as well- which increased the financial scope of the project :^). Just saying, unless you are trying to stay as stock as possible, the 8" is going to be tougher, is super-easy to find parts for, and the rear drums will be slightly bigger as well. Good luck with the rebuild (would like to see a video of the new one once installed). the kit shown in the picture at rock auto is just a stock photo and doesnt necessarily represent the parts in the kit. rebuilding the rear end isnt hard to do though, but you do need a few specialized tools, a dial indicator and magnetic mount, a torsion style torque wrench(it reads instant torque as you turn the tool so you can get a reading on preload), and click type torque wrench, and a pair of dial calipers to measure washer and shim thicknesses. Thanks guys - I'd really love to do the rebuild myself - really enjoy doing jobs like that but after looking in my box of talent I don't think there's enough in there to get all the tolerances / shims correct!.. so will no doubt take it to an axle specialist..
shame really unless there's a very very explicit step by step guide somewhere.. I know about the one on mustang monthly article http://www.mustangmonthly.com/howto/mump_0912_1965_ford_mustang_convertible_rear_axle_rebuild/pinion_gears_and_differentials.html but that doesn't prescribe how / where to put shims etc. How many / what are the major hard parts to re-doing the lot myself including changing spider gears inside the diff itself?.. as for 8" yeh the only prob is finding an axle in the uk to start with then the prob with all new wheels / tyres for 5 stud ..
rebuilding a differential itsnt hard, in fact most people with the standard two thumbs can do the job easily. the devil is int he details though, and the details in this case is getting the shim and preload adjustments right. if you take your time with the right tools, you can do this. the shop has a very high reputation, uses quality parts and does ship internationally, iirc. Is there any guide that walks you through it at all and that would explain exactly how to set everything up - eg the '65 mustang / comet etc workshop manual..? ah yeh that's the one I meant! Have been procrastinating about buying that for ages so will get it tonight and have a nose! Cheers, Bought the electronic manual! the carrier is the part that holds the differential and drive gears. with an 8 or 9 inch rear end the carrier is removable from the housing. it is variously called a pumpkin, drop out carrier, chunk, etc. it was designed so that you dont have to pull the entire rear end from the car to swap gears. A few questions as parts are now on their way across the pond to me! Have ordered NOS pinion and side gears for the inside of the diff. Also have ordered the rebuild kit which includes bearings, seals and the likes of crush sleeve. Am thinking of changing the wheel bearings too - not sure if I need to - I think I have about a millimeter of play in and out - 1. should there be any play at all laterally in my bearings? Also have found somewhere that will do the work for about $250 so for that money am not going to even consider trying to do it myself! One thing I wasn't understanding was that rbohm you mentioned "removable carrier ... was designed so that you dont have to pull the entire rear end from the car to swap gears." .. am being a bit thick I think - surely once driveshafts and bearing caps are off it's possible to remove diff and pinion without removing the axle.?? .. am sure I'm misunderstanding but thought I'd ask! 4. am after a nos (or perfect condition) 2.83 ring and pinion just in case anyone knows of one. If I got a 3.2 does it make a massive amount of difference to the gearing? (I have a C4 Cruise-o-matic) .. from the figures that comes out at an engine revving 13% faster to achieve the same road-speed .. .. maybe it wouldn't be toooo bad ..? 1. There should be no noticeable play in the axel bearings if it were me I would likely replace them while its already apart. Though since its not that big of job to pull them you could also wait and replace them sometime in the future, your call. 2. Those all look to be the same bearing numbers just differant brands of them, the correct "part number RWF 34-R" so your choice as to which to use. Those bearings were used on many brands of cars, Have you tried to see if they interchange to bearings you might have locally available? 3. If your axel gaskets are still in one piece you could reuse them again with a little silicone or you could get some gasket paper and with a little time cut out a new set. 4. On the 2.83 to 3.20 you will loose a little fuel economy with a bit more engine noise and wear at hi way speeds,on the plus side you gain a little performance or speed on the take off from a stop. Yeh I'll 're-check' the bearings and maybe get some new while they're off .. although they don't make any noise so should be ok ..
Yeah is probably a just a typo on the listings, check the below dimensions I think they are accurate. what you will find with most bearings no matter what brand is the back number is usually the same so if you can find a cross reference book you should be able to find them or convert to other numbering systems used. 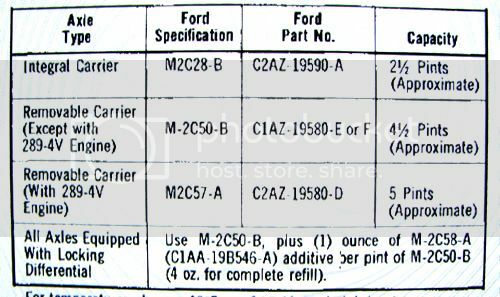 Fits Ford, Mercury, GM, Dodge, Plymouth, also were used on Trucks and Trailers, I would not be surprised if they weren't maybe used on many English and European models too. If you look around, the 7-1/4" axle has a 2.83 to 3.20 to 4.00 crown wheel and pinion for it, and a limited slip diff Equa Lok version. Mike from Classic in lines disussed it many years ago.